I haven’t met many people who say they aren’t fans of pizza and today I’m going to make your mouth water with what I call my Margherita Pizza. There isn’t a gathering that I’ve held or been to where I’ve made this pizza where friends and family are wanting the recipe. Now, they won’t have to ask as my secret Margherita recipe will be shared here today and available forever. What I love about making homemade pizza is that my family can get involved and we all enjoy creating a custom pizza that we will all enjoy. No one says a pizza has to be topped with just mozzarella and pepperoni. Don’t worry if you don’t have round pizza baking sheets or any mad dough throwing pizza skills either. I make my pizza in square pans and cut them into squares and you know what? They taste the same as if it were shaped like a round pizza pie. If I do say so myself nothing beats pizza whether it’s on a weekday or a Friday night and I’ve even had the pleasure to eat pizza for breakfast. Now you know me by now I like my food and I love to cook and when it comes to pizza it has to be a proper pizza dough with the perfect pizza sauce to match it. My family loves a rich, garlic, tomato sauce with loads of herbs layered on the pizza dough and then topped off with something simple as mozzarella cheese to a spicy sausage and onion. My Margherita Pizza today will showcase mozzarella with onions and summer sausage as my extra pizza toppings. A good, authentic Italian pizza starts with the freshest ingredients and toppings. Now you don’t have to go and make your own ricotta or mozzarella but if you know how, even better. A good pizza can be as simple as fresh basil leaves and fresh mozzarella (even the buffalo mozzarella balls) and the perfect pizza sauce. You can top a pizza with anything but with it coming into the garden season if you have a green thumb you may have fresh herbs such as basil and chives or organic tomatoes and garlic at your fingertips so there is no excuse not to make a homemade pizza. The one thing I like about pizza is that everyone has their favourite pizza and I enjoy trying different recipes aside from my own. Even though I love my Margherita Pizza I don’t mind venturing out to see what other cooks have created in their kitchen. Even Mr.CBB makes his own pizza and has shared his Olive Pita Pizza recipe topped with mushrooms, ricotta and basil pesto which is dead easy to make as well as his Better Than Take-Out Pizza recipe. Both delicious. If you aren’t a fan of dough Mr. CBB went one step further and created a cauliflower pizza which is certainly unusual but for those that like to try something new, give it a shot. In just over an hour today I’m going to show you how you can have your own ooey, gooey Pizza Margherita on the table. Yes that’s all it’s going to take you to make a homemade pizza. Just factor in the time you research you pizza shop, call the pizza shop and the time it takes to make and deliver or pick-up a pizza and you could have done it all yourself. Not to mention making homemade pizza is much easier on the budget than spending money to have pizza delivered or picked up from the pizza shop. Sure pizza restaurants have the pizza dough and ingredients already prepped and ready to go but not all ingredients are created equal. If you use the best you get the best pizza results. You might not have a stone oven in your back garden but as long as you have an oven you can be watching a movie, having a party and enjoying my Margherita Pizza in no time. And even if you don’t have the garden fresh tomatoes ready in your garden the tin tomatoes or even fresh from the grocery store variety does just as well as you will see from my recipe. 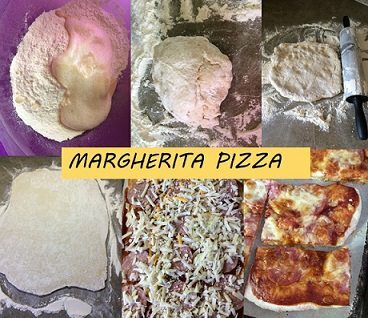 So, get ready to bring my Italian pizza recipe into your home and into your tummy, you’ll be happy you took the time to make the best Margherita Pizza. Place the yeast and sugar in a measuring jug and mix with ¼ cup of warm water. Mix the flour with the salt and make a well in the centre. Add the oil, yeast mixture and the remaining water into the flour. Using a wooden spoon, mix to form a dough. Turn the dough out onto a floured surface and knead for 4-5 mins or until smooth. Return the dough to the bowl and cover and leave to rise for 30mins or until it has doubled in size. Knead the dough for 2 mins. You can either stretch the dough into shape with your hands or roll it out if you prefer a thinner base. In saying that it should be no more than 6 mm ¼" thick because it will rise slightly during cooking. To make the topping, place the tomatoes, garlic, basil, olive oil and salt and pepper to taste in a large frying pan (or skillet) and leave to simmer for 20 mins or until the sauce has thickened slightly. Then stir in the tomato puree and leave to cool slightly. Spread the topping evenly over the pizza base. I find using the back of a metal spoon easiest for getting it to an even thickness. Top with the mozzarella and Parmesan cheeses and whichever topping you like and bake in the oven for 20-25 mins until golden and the mozzarella has melted. So go on have a go at making this Pizza Margherita by raiding the refrigerator to see what toppings you can use up tonight. Are you rich just because you are debt free? Guys I really do hope you have a go at this pizza the dough and the sauce are a match made in heaven truly delicious ! Thanks Nicola… I can’t wait to try your pizza! Thanks for this margherita pizza Nicky! I really do love pizzas, especially with cheese overload. 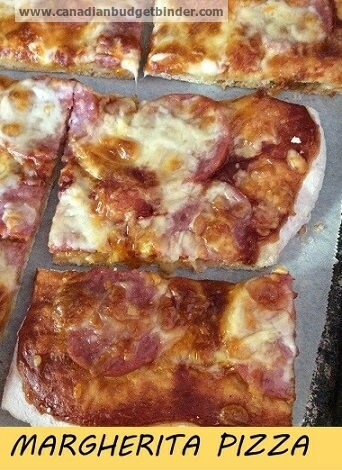 My daughter experienced to make a Hawaiian pizza in their school last year. Looks good Nicola!! I have a bread machine and found a nice recipe to use foe pizza dough so I use that. Just toss everything into the machine, set for the dough cycle and go do what ever to come back later. The yeast for the bread machine comes in those little jars so I’m being forced to make pizza or something else fairly often in order to use up the yeast…Lol!!! I just use cookie sheets for my pizza as I don’t have the round pans either, it works so why mess with a good thing. Back in her teens our daughter worked at the pizza place across the street for about a year so she brought home a trick or two like taking a fork to the dough before you top it so it doesn’t bubble so much. Ham, pineapple and green pepper are favourites for pizza here. So Hawaiian is what is usually made here. The grandson is happy with just cheese on his, no sauce but there for dipping as he eats. Crazy kid!! The sauce recipe looks good too! I see pizza in our future again soon!!! !